Cast your mind back to earlier this month and you’ll remember that we bumped into British singer Olly Murs for a quick natter while he was on Australian soil for a week of promotional activities (you can read that interview HERE). Given it was a face to face meeting with the former X Factor UK star, and how much we know you love a good giveaway here at auspOp, we couldn’t resist the temptation of getting a few copies of his latest album ‘In Case You Didn’t Know’ personally signed. And of course, because it’s our birthday – and also because we’re a generous lot, we decided not to keep them for ourselves, but to hand them over to you, our ace and dedicated readers! Shoot through an email containing your name and postal details to the address up top in the sidebar and pop the term “My Heart Skips A Beat For Olly” in the subject line to be entered into the competition. Competition closes at 10:00pm AEST on Wednesday June 06, 2012. Only one entry per residence will be accepted. Winners drawn entirely at random. Winners’ first names, suburbs/towns and states will be published on the site on Thursday June 07, 2012. 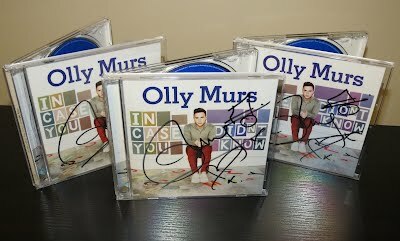 Three of our biggest Olly fans will each pick up a SIGNED copy of his brand new album ‘In Case You Didn’t Know’ with big thanks to us! And as always, we’re certainly not about to tell the world about your private details. They’ll find a little home with us ’til the competition is drawn and prizes are sent out. Thereafter they’re deleted, so it’s reason to just smile!